Funeral services for Della LaNell Plaunty, 95, of Silsbee will be 2:00 pm Friday, November 10, 2017 at Farmer Funeral Home with interment following at R S Farmer Memorial Cemetery in Silsbee. Visitation will be from 1:00 pm until time of service Friday at the funeral home. Mrs. Plaunty passed away November 6, 2017 at her residence. 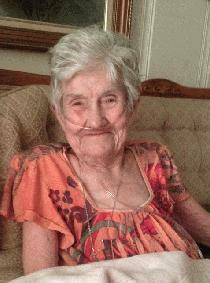 A native of Rusk, Della was a long-time resident of Silsbee. She worked many years as and LVN at Hardin Memorial Hospital in Kountze before retiring. Mrs. Plaunty was a member of Genesis Baptist Church and the Silsbee Coin Club. She was a loving wife, mother, sister, grandmother, and friend. She is preceded in death by her parents Frank and Ethel Rausin; husband Albert J. Plaunty Sr; daughter Sonja Quinette Bryant; brother George Stover; and sister Flossy Laney. Left behind to cherish her memories are sons David Plaunty of Silsbee, Albert Plaunty Jr. and wife Janice of Silsbee, andMark Plaunty and wife Debra of Silsbee; daughter Carolyn Lewis and husband Thomas of Silsbee, Paula Simmons and husband Joe of Silsbee; brothers Ervil Stover of Jacksonville; sisters Gracie House of Frankston, Berniece Lovelady of Jacksonville, Reba Berry of White House, Ethel Lewis of Jacksonville; and seventeen grandchildren, thirty great grandchildren, and fifteen great great grandchildren. Della will be greatly missed by all who knew and loved her. Prayers to all the families.My mother Lottie King,Hudson,loved all the family.I remember seeing family at the KING REUNIONS. Della will have a great time with all the family in HEAVEN. She was one of GOD'S ANGELS.